I hope you don't mind me contacting you, but I got your details from your website. I have recently started researching my family tree, and family legend has it that my grandad's brother was in the Royal Navy and "on the only hospital ship which was sunk by a torpedo in World War 1". Can you confirm if the HMHS Glenart Castle was in fact the only hospital ship which was sunk by torpedo during WW1. My grandad's brother's name was Roland Pride - I wondered if there was anywhere I could find a crew list. I've been told that he survived the war to die of pneumonia in 1923. I would appreciate any help you can give with this. Thats fine, but I am afraid that HMHS Glenart Castle was not the sole Hospital ship in WW1 to collect a torpedo, but she only had 38 survivors, and I have not found that list anywhere. At the time of her sinking the ship was owned by the Union Castle Mail Steamship Company of London, that company was still in existence in the 1960's but I am unaware of the situation today. I suggest you search to see if that shipping company still exists, if so, they may have crew lists in their archives. Now these Hospital ships were also torpedoed in WW1. HMHS Drina, torpedoed by UC-65 on March 1st. 1917. HMHS Dover Castle, torpedoed May 26th. 1917. HMHS Rava, torpedoed by U-55 January 4th, 1918. HMHS Llandovery Castle, torpedoed by U-86 June 25th. 1918. My friend Martin in UK has come up with this for you. I saw the letter from Kate Vokes about her grandfather's brother, Roland Pride. The following link to the National Archives (UK) may be his Royal Navy service record. If it is his (hopefully date and place of birth are known) and Kate doesn't already have it, it can be downloaded in PDF format for £3.50. It should hopefully list all of the ships he served on. Below are some notes on Glenart Castle casualty and survivor numbers from The Times, incl. a list of most survivors. The name Pride is not listed. Sunk in the Bristol Channel at 4 a.m. on Feb 26 1916. Note: There were no patients on board. P. Jacobson, Malabar-street, Poplar, S.E. F. Fish, Beckley, near Christchurch, Hants. T. Tuzzlan, Upper Marsh, Lambeth. I'm getting more and more intrigued the longer I look at this! It seems to me that there are more sets of dates than places Roland served - if you enlarge the file, just above Gibralter Hospital there appears to be straight line of blank as if some detail has been removed, is this usual on this type of record? I am also interested in the part referencing "Badges" - it lists "1 GCB granted 4.8.17". Would this be a medal? Along the same lines, my mum has told me about 2 more of her uncles who served during WWI (it seems that my grandad was the only one who didn't serve as he was too young) - Albert Montegue Pride, served in the navy Sick Berth Reserve with his brother & Oscar Neville Pride who served with the Gordon Highlanders. I've managed to download records of Monty's naval service & Oscar's medal card. I would appreciate it if you could have a look - I'm particularly interested in the cause of discharge for both (Monty appears to have been injured at Pembroke but I can't make out the detail). I did not keep Roland's record. A GCB is a Good Conduct Badge there were three, the first awarded after three years Good Conduct Service, the second after 8 years service, and the third after 13 years service. It was red chevron worn on the left sleeve on the day to day uniform, and on your No1 Uniform it was Gold. This is a picture of a Petty Officer's ( crossed anchors ) three GC Badges. In red for working uniform, in gold for his No. 1 uniform. A small daily pay increase came with a GCB award. Monty was in Chatham Hospital from the 31st. August 1916 to the 2nd. of May 1917, when he was invalided out of he Navy with Fibroid Phthisis. I note his occupation had been a Pattern Cutter, which means he probably worked in a textile factory, perhaps the floating fibres from cloth in his work place caused his problems. Now to Oscar's Medal Card. He enlisted as a private in the Gordon Highlanders on 13/2/1915, to be discharged on 5/12/17 by AO 265/17 Para 2 ( b1 ) AO may stand for Army Order. In WW1 the Briish issued three Medals: The Victory Medal, The British War Medal, and the 1914- 15 Star. 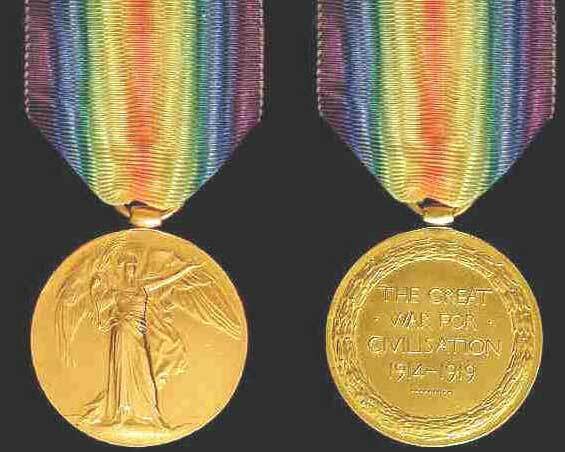 The ribbon to the World War I Victory Medal consists of a double rainbow, with the red joining in the center. The ribbon is edged with very narrow stripes of white. The rainbows were selected to represent a "new era" and the calm after a storm (alluding to the First World War). It also represents the combined colors of the Allies joined together in a common cause. The two rainbows also represent the two groupings of nations, Allied and Associated, meeting the heraldic colour for conflict and bravery. The use of the double rainbow also provides symmetry and balance and avoids having the ribbon confused with that of the British 1914 Star (which, although not a rainbow, is similar). 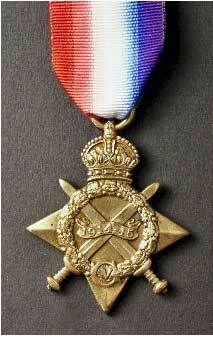 The British War Medal, issued to British Commonwealth Troops. Army, Navy, Airforce, or Nursing Service. Issued at the end of the First World War, this medal celebrated the final victory. The silver medal shows a male on horse back crushing a shield displaying German coat of arms. The destruction on the battlefield that so horrified all those involved is symbolised by the human skull and crossed bones under the horses rear feet. The date of 1914 and 1918, indicate the years of combat, where as peace was finalised in 1919. Instituted in 1918 for recognition of Campaign service during 1914 through to 1915. This medal was awarded to British and Commonwealth forces totaling 2,350,000 awards. These medals were always issued named in impressed lettering to British forces. Issuing of the 1914 Star voided intitlement to this medal. A red, white and blue ribbon the same as the 1914 Star was issued with this medal, original ribbons are made from watered silk. These Medals were only issued in bronze and had no intitlement to a clasp. Medal dimensions are height 50mm and width 45mm, the design is the same as the 1914 Star with only one central banner and the dates 1914 -15. Miniature versions of this medal were also issued. It looks as if Oscar was awarded the Victory Medal and the British War Medal. It carried a Rosette on the Ribbon for those labelled The Contemptible Little Army by the German Kaiser, my Dad had won that Medal with a Rosette, and after migrating to Australia in 1919 he became the President of the Old Contemptible Association. Rosette on 1914 Star ribbon, The British War Medal in centre, the Mention in Despatches emblem is on the Victory Medal Ribbon. The ribbon of the 1914 Star medal is the same for the 1914-15 Star medal. Hope this helps a little Kate. I did receive it - thanks so much for the information, all very interesting. Going back to Roland's record - I managed to find a HMS Magic which served as a hospital ship during WWI (www.simplonpc.co.uk/BelfastSS.html#anchor37430). I'm still intrigued with the part that looks like it's been censored though! (I've attached the record again). Good work in finding details for Magic as a Hospital ship. Do you mean after the entry for Gibtaltar Hospital? I think that wiggly line is merely saying ditto, Roland is still at Gibraltar Hospital but has been advanced to the SRA rating, and that is recorded. This mail from Rina Field may be of interest to you. I was very interested in the recent mention of the Glenart Castle. My grandfather served on that ship during WW1 as part of the RAMC medical team & was one of the many that didn't survive the torpedo attack ' 20 miles West of Lundy Island on Feb 26 1918' (original entry in Lloyds War Losses of The First World War). The HOLLYBROOK MEMORIAL, Southampton is 'Commemorated in perpetuity by the Commonwealth Graves Commission' to the officers & men of the British Empire who lost their lives during WW1 & whose graves are unknown. The wreck of the Glenart Castle has been found & there are sonar images of it on the Glenart Castle internet site. Apparantly it is in a very treacherous part of the Bristol Channel that can only be accessed twice a year. There is a CD available on the work done so far & the website for more information is & www.ilfsac.org.uk/glenart .